Before I give the details on this card, I want to say that this is a card I did back in December of 2011. Yes…it is an OLD one! I had this posted on my old blog and it is ‘all over’ Pinterest! I frequently get questions about this and thought, since people do ask about this a lot I’d do a re-post on here so that everyone can find the information. Unfortunately I don’t have the card to do the dimensions for you, but I’ll give some approximations. I had used this for a presentation I did for Stampin’ Up! at a regional and this was the card they selected to keep. It really is a BEAUTIFUL card in person! Whisper White – 4 x 5 1/4, run through the Snowburst Embossing Folder (retired). Add to card front. OLD Silver Glimmer paper (this is lighter than the current Silver Glimmer paper but a little darker than the Dazzling White Glimmer paper) – maybe 3 1/4 x 4 1/2. I cut out the inside of this panel so it makes it easier for the top panels to adhere to it. 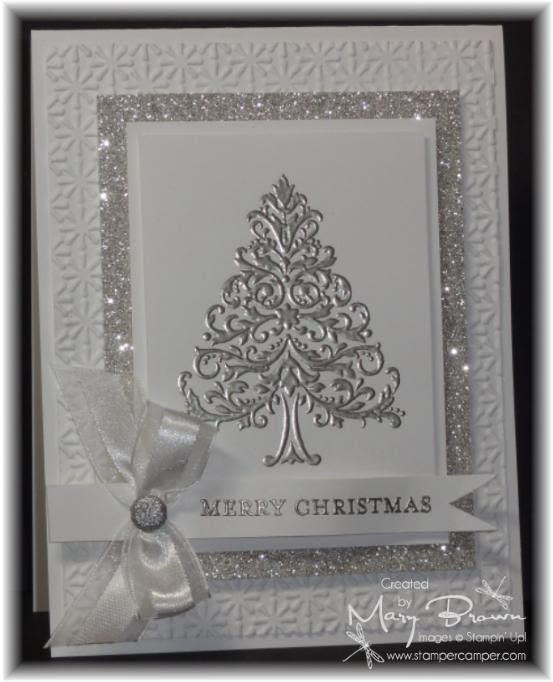 Whisper White – maybe 2 5/8 x 3 7/8, stamp tree using Versamark and emboss with Pewter (can substitute Silver) Embossing Powder, add using dimensionals. Make a ‘bow’ (check out my tutorial on this) using White Organza and Neutral Glimmer Brad, add to banner and add using dimensionals. Hope you enjoyed this ‘blast from the past’ and until next time…HAPPY STAMPIN’!